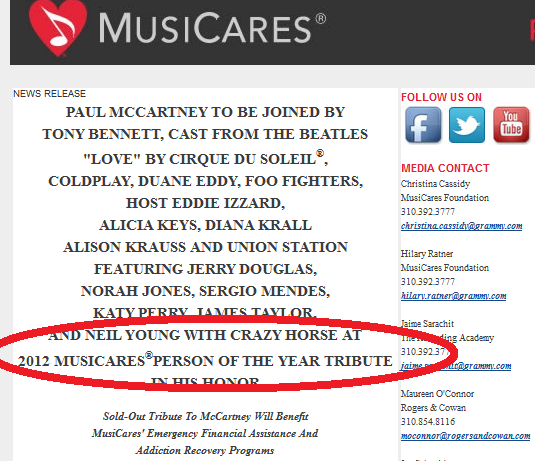 Neil Young News: POLL: What Song will Neil Young & Crazy Horse cover for Paul McCartney at MusiCares? POLL: What Song will Neil Young & Crazy Horse cover for Paul McCartney at MusiCares? 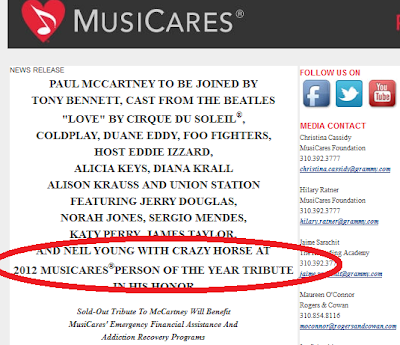 What Paul McCartney song will Neil Young & Crazy Horse cover at Musicares Benefit? The news that Crazy Horse & Neil Young will reunite to play for Paul McCartney at the 2012 MusiCares Honors has electrified fans and generated much speculation about what song they will cover. The 2012 MusiCares Person of the Year for honoree Paul McCartney will be this Friday, Feb. 10 in Los Angeles. So ... what Paul McCartney song will Neil Young & Crazy Horse cover? The poll above represents a sample of the suggestions left in comments of possibilities. Here's what we're thinking. Folks can vote for their Top 3 and then we'll have a runoff this weekend of the top nominations. The format for Musicares in the past has been one song per band. But maybe Neil & The Horse will do a medley? How cool would a road trip/car medley be? Long and Winding Road, Why Don't We Do it in the Road?, Backseat of My Car, Baby You Can Drive My Car? Any medley suggestions can be placed in comments below. Also, feel free to suggest any Paul songs not already listed and we'll try and add to the poll. Lastly, will Paul join Neil & The Horse? If anyone accurately predicts whether Paul will join Neil & The Horse, the medley selection and sequence, Thrasher's Wheat will be awarding some sort of prize or honor. (you must submit as a registered comment). *A fourth vote is allowed when selecting "Medley of songs". Initial thought: I'd like to hear "Get Back"
I would love to see a Horsed up version of Helter Skelter. how apt is this! a "Gallop" pole with Neil and the horse! Is too corny to do "Hey Jude" as encore with everyone on stage? My first inclination is "Let Me Roll It" because of it's repetative little riff thing and its pace. But that was Paul doing John so...I don't know. I think a Horse-ified "Get Back" would be awesome. "Junior's Farm" would also be cool. But the more I think about it - "Let it Be". There is enought space in "Let it Be" for the Horse to lay down a great rhythm and let Neil rip on it. George's lead on the album version of "Let it Be" is about his finest moment. Definitely Helter Skelter - the thought of Neil & the Horse doing this one gives me chills. "Α Day in the Life" and "Lucy in the sky with diamonds" are John Lennon songs. Paul wrote just the bridge in "Α Day in the Life". I vote for "For no one" or "Eleanor Rigby" because I am curious how will they cover them, the rest are too obvious. Of the songs on the list, I doubt the Horse could handle most of them. And Paul's bridge aside, "A Day In The Life" is really more of a John song. That said, I hope they exceed my expectations and do something with more than three chords. My guess is they'll perform one of the Beatles songs Neil used to play with the Squires when he first started out, maybe 'I Saw Her Standing There' or another early one. Good call, Joe. "Saw her standing there" would be a great song for Crazy Horse. Is it Pancho or Poncho? Foo Fighters "Band on the Run" or "Black Bird"
Nora Jones "Black Bird" or "Rocky Racoon"
Sweet Baby James "Rocky Racoon" or "Jenny Wren" or "Here, There, and Everywhere"
Kate Perry "Here, There, and Everywhere" or "Follow the Sun"
That was one we used for a fraternity sing along at college talent night. Went down like a lead ballon but Crazy Neil and the Horse could make it rise again. That would be fun for Kate Perry to do that song with her muppet friends. Austin Rivers just hit a three to beat the Tar Heels and called it "the best day of my life". So Neil will be doing Day In The Life. Or (the more I think about it), "Hey Jude" as the show closer. It would also serve as a nod to John since the song is, I believe, about Julian (if Yoko's in the audience "Get Back" could seem a little mean-spirited). Interesting to me how Lennon's ghost always lurks in the background at these Sir Paul events. LOS ANGELES (Reuters) - Paul McCartney finally got his own star on Hollywood's Walk of Fame on Thursday, becoming the last of the four Beatles to get the honor. "In Liverpool, when we were kids and listening to Buddy Holly and all the other rock and roll greats, I would have never thought the day would come when I'd be getting a star on the Walk of Fame. I thought it was an impossible thing to happen. But here we are today," McCartney, 69, said. "I couldn't have done it without a certain three boys, so I want to say thanks to those guys, John, George and Ringo," he said. McCartney's star was placed outside the Capitol Records building, alongside those of band members John Lennon, George Harrison and Ringo Starr. The Beatles were given a star as a group in 1998, more than 25 years after they split up. Lennon and Harrison were given their individual stars several years after their deaths in 1980 and 2001 respectively, while Starr got his in 2010. Hundreds of fans of the Fab Four gathered, clutching memorabilia, to see McCartney honored for his 50-year legacy in the music industry. Starr was prevented from attending Thursday's ceremony because of illness, but rocker Neil Young was on hand to pay tribute to McCartney as a singer and songwriter "at the top of his game." This is just monumental on so many levels...time to get serious. There are many ways this can go. But the message that Neil and Pegi and Paul and all of the rest want to send is family, love, trust and belief in the world and your fellow human beings. So this is going to be one of those moments and we can rejoice in it together. Final choice is Because and You Never Give Me Your Money ending with Get Back...and Paul is all in. My reason? It would be just too damn beautiful not to happen and I believe in the power and the glory of rock and roll. Once a journey is designed, equipped, and put in process, a new factor enters and takes over. A trip, a safari, an exploration, is an entity, different from all other journeys. It has personality, temperament, individuality, uniqueness. A journey is a person in itself; no two are alike. And all plans, safeguards, policing, and coercion are fruitless. We find after years of struggle that we do not take a trip; a trip takes us. Maybe "I Saw Her Standing There"
I voted for Jet, which was played, only not by Neil and Crazy Horse, I wonder how Foo Fighters did with it? I can't wait to hear their version of "Saw her Standing There." ... I changed my mind. I decided 'I Saw Her Standing There' would be a good choice! I don't know why, it just came over me ... we'll see what happens, LOL!